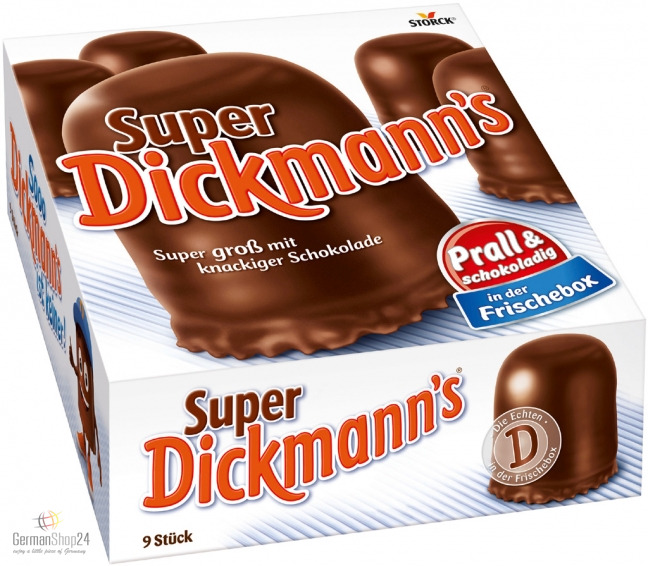 9 Super Dickmann’s with crunchy chocolate coating and super foamy filling. Since 1985, Super Dickmann’s has been big among the chocolate foam kisses. Under the motto „Man, they are Dickmann“, Super Dickmann’s from Storck quickly became Germany’s most popular chocolate foam kiss. This has not changed until today, because they are still super big, super yummy with a crunchy chocolate coating and a super foamy filling and unmistakable with the „D“ on the crispy waffle. Best suitable for sharing with family or friends but also as souvenir for the next big birthday party. Simply the best party fun for young and old. A gentle kiss and an irresistible pleasure almost no one can resist. 9 big chocolate foam kisses are included the freshness box. This product has a very short Best-Before-Date (BBD). This product is extremely heat sensitive and fragile and we highly recommend the use of our cooled shipping option. Please also note: This item is extremely fragile and difficult to send. The chocolate coating may crack and crumble at higher altitudes and without the proper air pressure in the airplane cargo hold. We will conscientiously pack this product, but can not guarantee that it will arrive without major damage. Please order at your own risk. We do not offer refunds on damaged merchandise. Thank your for understanding. 250g / 8.82 oz NET. WT. Glucose-fructose syrup, chocolate 24% (sugar, cocoa butter, cocoa mass, fat-reduced cocoa, WHOLE MILK POWDER, emulsifier lecithins (SOY), vanilla extract), waffle (WHEAT FLOUR, sugar, CREAM POWDER, palm fat, emulsifier lecithins (SOY), natural flavor, raising agent sodium bicarbonate, salt), humectant sorbitol syrup, DRIED HEN'S EGG PROTEIN, natural flavor. May contain traces of hazelnuts, almonds and other nuts. Glukose-Fruktose-Sirup, Schokolade 24% (Zucker, Kakaobutter, Kakaomasse, magerer Kakao, VOLLMILCHPULVER, Emulgator Lecithine (SOJA), Vanilleextrakt), Waffel (WEIZENMEHL, Zucker, SAHNEPULVER, Palmfett, Emulgator Lecithine (SOJA), natürliches Aroma, Backtriebmittel Natriumhydrogencarbonat, Salz), Feuchthaltemittel Sorbitsirup, HÜHNEREI-TROCKENEIWEISS*, natürliches Aroma. *Aus Bodenhaltung. Kann Spuren von Haselnüssen, Mandeln und anderen Nüssen enthalten.